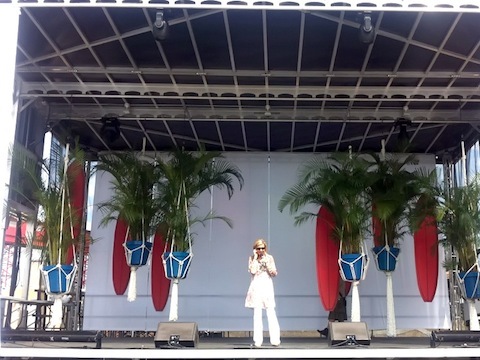 I just got this emailed to me and thought I'd share this clip of Olivia Newton-John doing a bit of sound check of "Magic" for her appearance tonight at the NYC Gay Pride "Bondi Beach" event. 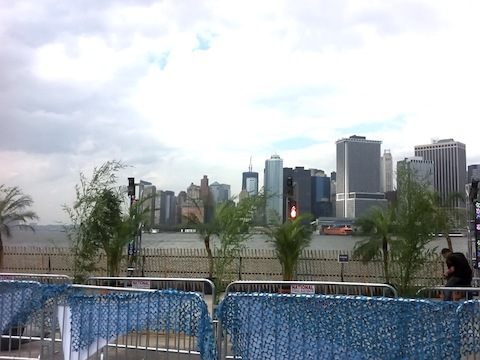 I like Olivia starts to dance a bit as the camera pans to the view. You can download the new version of her mega-hit "Magic" from iTunes - click here. ALL proceeds go to the Olivia Newton-John Cancer and Wellness Centre. The view from the stage and dance area looks like it will be amazing for the event tonight. You can see where they are in the process of putting palm trees in place on the stage for that "beach" feel. Weather's finally cleared up - and with marriage equality having just passed last night in NY state I imagine there are some folks ready to dance tonight! Event info: Saturday, June 25th @ 6:00pm // Bondi Beach on Governors Island. With Olivia Newton John, DJ Phil Romano and DJ Hector Romero. Governor’s Island, NYC. Olivia will be singing about three dance songs (including the new remix of "Magic") during the evening for some happy folks tonight. In addition to Olivia, the party features two of the best DJs in the business. Go out and have a good time kids! For more information, please visit: www.fvevents.com. 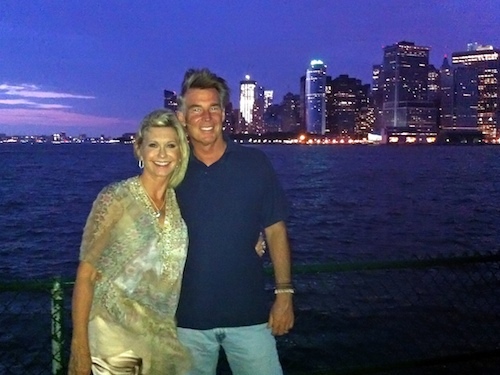 Olivia and John at the Bondi Beach event in NYC - how about the view? Thanks for posting, Randy.....looks like it will be a terrific night! Randy, I love your blog. I rely on it for Olivia news several times per week. Thank you and keep up the great work. Randy....It was a great night (Bondi Beach)...was on the ferry with ONJ's SUV as it prepared to leave the island....I was so kind of her to allow a fan to get a T-shirt autographed... was so jealous! We miss you in the Netherlands.... It's been tooooo long. A fan since 31 years.